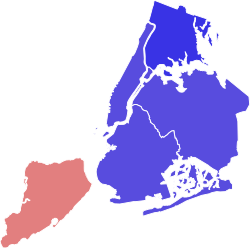 The 2013 New York City mayoral election occurred on November 5, 2013, along with elections for Comptroller, Public Advocate, Borough President, and members of the New York City Council. The incumbent mayor of New York, Michael Bloomberg, a Republican-turned-Independent, was term-limited and thus unable to seek re-election to a fourth term in office. Primary elections were held on September 10, 2013. The Republican nominee was former Metropolitan Transportation Authority Chairman Joe Lhota. New York City Public Advocate Bill de Blasio was the Democratic nominee. De Blasio was elected mayor with 73.15% of the vote. Republican and Republican-endorsed candidates had won five successive mayoral elections in New York City. Republican Rudy Giuliani was elected in 1993 and re-elected in 1997. Republican Michael Bloomberg was then elected in 2001 and re-elected in 2005. He left the Republican Party in 2007, and successfully persuaded the city council to extend the city's term limits law so that he could run for a third term. He was re-elected as an Independent on the Republican and Independence/Jobs & Education ballot lines in 2009. The term limits law was subsequently changed by a referendum in 2010, reverting the limit to two terms. On April 2, 2013, federal law enforcement officers arrested numerous New York City-area politicians. These included Democratic state senator Malcolm Smith and Republican city councilman Dan Halloran, who were charged with trying to bribe various Republican political leaders so as to get Smith onto the ballot as a Republican. The Mayor of Spring Valley and local Republican party leaders were also arrested. Newsday Editorial, October 28, 2013: "Joe Lhota is the superior candidate. Newsday endorses Lhota for mayor." Crain's New York Business editorial "Joe Lhota for mayor"
AM New York Newspaper editorial: "Elect Joe Lhota mayor of New York"
The Jewish Voice endorsed Joe Lhota in an editorial on October 31, 2013, stating "Vote for the Most Qualified Candidates on November 5!" Rubén Díaz, Jr., Bronx borough president. Besides the Democratic and Republican parties, the Conservative, Green, Independence and Working Families parties are qualified New York parties. These parties have automatic ballot access. Any candidate not among the six qualified New York parties must petition their way onto the ballot; they do not face primary elections. After the party twice endorsed a candidate for mayor, only to see them withdraw from the race, the party declined to endorse a third candidate, although they did consider endorsing Jack Hidary. Joe Lhota was originally nominated as the Libertarian candidate during the Party Convention held on April 6, 2013, a nomination he declined. It was soon after ruled by the Libertarian Executive Committee that this nomination was invalid and void due to the attending voters of this first Convention not being properly credentialed. A second nominating convention was held on June 11, 2013, which nominated Michael Sanchez. ^ Grynbaum, Michael M.; Kaplan, Thomas (September 16, 2013). "Thompson Concedes to de Blasio in Mayoral Primary". New York Times. Retrieved September 16, 2013. ^ Walker, Hunter. "John Catsimatidis: 'I'm Not a Mike Bloomberg Billionaire'". Politicker.com. Retrieved April 11, 2013. ^ a b Benjamin, Liz (November 13, 2012). "Brooklyn GOP Chair Backs Carrion (Updated)". Capital Tonight. Retrieved November 18, 2012. ^ Katz, Celeste; Donohue, Pete (November 15, 2012). "GOP eyes MTA boss Joe Lhota for mayoral run". New York Daily News. Retrieved November 18, 2012. ^ Katz, Celeste (August 11, 2012). "Doe Fund Founder George McDonald Mulling 2013 Mayoral Bid On Republican Line". Daily News. New York. Retrieved September 17, 2012. ^ Benjamin, Liz (September 17, 2012). "Extras". Capital Tonight. Retrieved September 17, 2012. ^ a b Walker, Hunter (March 18, 2013). "Tom Allon Is Dropping Out of the Mayor's Race". Politicker. Retrieved March 18, 2013. ^ Chen, David W. (November 12, 2012). "Likely Mayoral Hopeful Leaves Democratic Party". The New York Times. Retrieved November 18, 2012. ^ Katz, Celeste (April 9, 2013). "Brooklyn Republican Party leader backs John Castimatidis, eliminating Adolfo Carrion's chances for GOP ticket". New York Daily News. Retrieved August 18, 2013. ^ Barkan, Ross (January 25, 2013). "Independence Party goes to bat for Carrion". Politicker.com. Retrieved January 28, 2013. ^ Benjamin, Liz (August 1, 2012). "Malcolm For Mayor On GOP Line Over Before It Starts?". Capital Tonight. Retrieved September 17, 2012. ^ Katz, Celeste (March 11, 2013). "Brooklyn Megachurch Pastor A.R. Bernard Stops "Actively Considering" 2013 GOP Mayor Run". New York Daily News. Retrieved March 18, 2013. ^ Pappas, Alex (November 30, 2012). MSNBC host S. E. Cupp urged to run for mayor of New York City. The Daily Caller. Retrieved November 30, 2012. ^ Wrobleski, Tom (October 17, 2012). "Staten Island District Attorney disavows mayoral ambition". Staten Island Advance. Retrieved April 14, 2013. ^ Adams, Cindy (October 10, 2012). "Giuliani can run: NYC charter". New York Post. Retrieved October 21, 2012. ^ Walker, Hunter (October 11, 2012). "Spokeswoman For Rudy Giuliani Says He's 'Not Running For Mayor' Again". Politicker. Retrieved October 21, 2012. ^ Campanile, Carl (February 20, 2013). "Sen. Golden backs Lhota for mayor". New York Post. Retrieved March 18, 2013. ^ Garvey, Marianne (August 1, 2011). "Kelsey Grammer for mayor of New York?". MSNBC. Retrieved August 11, 2011. ^ Zwecker, Bill (August 1, 2011). "Kelsey Grammer sees his political aspirations as 'last piece of my life'". Chicago Sun-Times. Retrieved August 11, 2011. ^ Glynnis MacNicol (March 3, 2011). "MAYOR SPITZER: Former Governor Planning A 2013 Run, Says Gasparino". Business Insider. Retrieved March 3, 2011. ^ Coscarelli, Joe (January 13, 2013). "Ray Kelly Adamant He's Not Running for Mayor or Violating Anyone's Civil Liberties". New York. Retrieved April 11, 2013. ^ a b c d e Taylor, Kate (December 11, 2011). "To Find the Perfect New York Mayor, Only 2 Years Left". The New York Times. Retrieved December 15, 2011. ^ a b Barbaro, Michael; Grynbaum, Michael M. (January 7, 2013). "My Successor? Mayor Ponders Dream Choices". The New York Times. Retrieved February 3, 2013. ^ Haberman, Maggie (June 4, 2010). "Diana Taylor's own future". Politico. Retrieved December 28, 2010. ^ "Bloomberg's girlfriend Diana Taylor says she could have beaten Sen. Gillibrand, won't rule out run". Daily News. July 27, 2010. Retrieved December 28, 2010. ^ "NYC first lady Diana Taylor's eager to call it a term and take a trip, with or without Mayor Bloomberg". New York Daily News. March 6, 2013. Retrieved August 1, 2013. ^ "Lawmakers in New York Tied to Bribery Plot in Mayor Race". The New York Times. April 2, 2013. Retrieved April 3, 2013. ^ a b Michael M. Grynbaum, Liberal Party Backs Catsimatidis (May 7, 2013), New York Times. ^ Celeste Katz, Republican John Catsimatidis Endorsed By Liberal Party In NY Mayor's Race (May 7, 2013), New York Daily News. ^ a b c Celeste Katz, Brooklyn GOP Chairman Craig Eaton On Board With John Catsimatidis For Mayor (April 9, 2013), New York Daily News. ^ a b c d Celeste Katz, NYC Mayoral Hopeful John Catsimatidis Fires A Shot In Queens Republican Party's Civil War (April 13, 2013), New York Daily News. ^ a b c Barbaro, Michael (March 20, 2013). "Republican Council Members Endorse Lhota". The New York Times. ^ Celeste Katz, NY Senate Republican Leader Dean Skelos Backs John Catsimatidis For NYC Mayor (March 21, 2013), New York Daily News. ^ Tom Wrobleski (May 17, 2013). "With knock at Lhota and Dems, Staten Island GOP state Sen. Lanza backs Catsimatidis for mayor". SILive.com. Retrieved July 25, 2013. ^ Tom Wrobleski (March 1, 2013). "Assemblywoman Malliotakis endorses Republican John Catsimatidis for mayor". SILive.com. Retrieved March 1, 2013. ^ Celeste Katz, Ex-Governor of Puerto Rico, Backs John Catsimatidis For NY Mayor (April 30, 2013), New York Daily News. ^ a b "For New York Mayor Two Endorsements: Quinn and Lhota". New York Times. August 24, 2013. Retrieved August 26, 2013. ^ a b "New York Post endorses Christine Quinn and Joe Lhota in city's mayoral primaries". New York Post. August 26, 2013. Retrieved August 26, 2013. ^ Carl Campanile, Sen. Golden backs Lhota for mayor (February 20, 2013), New York Post. ^ Dan Janison, Rep. King boosts Lhota for NYC mayor; Catsimatidis has Liberal backing (May 7, 2013), Newsday. ^ Tom Wrobleski, Giuliani looks to flex Staten Island political muscle with fundraiser for Lhota. Will it work? (March 13, 2013), Staten Island Advance. ^ Celeste Katz, Bronx Republicans Back Joe Lhota For Mayor; May End Adolfo Carrion's GOP Primary Hopes (March 20, 2013), New York Daily News. ^ Michael Howard Saul (March 20, 2013). "Bronx GOP's Lhota Endorsement Strikes Blow to Carrion". The Wall Street Journal. ^ Tom Wrobleski, Staten Island GOP blesses Lhota's candidacy for mayor; Macron gets Council nod (May 7, 2013), Staten Island Advance. ^ Linette Lopez, Charlie Gasparino Writes a Glowing NYC Mayoral Endorsement for a Certain Goldman Alum (December 21, 2012), Business Insider. ^ Slepian, Stephanie (January 3, 2013). "Former Brooklyn city councilman Sal Albanese announces run for NYC mayor". Staten Island Advance. Retrieved July 25, 2013. ^ Campbell, Colin (April 17, 2013). "'Social Media Journalist' Announces Campaign for Mayor". Politicker.com. Retrieved July 25, 2013. ^ "Ceceilia Berkowitz Announces Big Apple Run". NYC Elects - 2013 (blog). Retrieved July 25, 2013. ^ Smith, Phillip (February 6, 2013). "Civil Rights Veteran Randy Credico Running for Mayor of New York City". The Daily Chronic. Retrieved February 28, 2013. ^ Chen, David W. (January 27, 2013). "De Blasio Kicks Off Campaign for Mayor". The New York Times. Retrieved January 27, 2013. ^ Michael Howard Saul (January 15, 2011). "Stringer Is Sprinting in 2013 Race". Wall Street Journal. Retrieved March 3, 2011. ^ Peltz, Jennifer (March 10, 2013). "City Council Speaker Launches NYC Mayoral Bid". Associated Press. Retrieved March 10, 2013. ^ Campbell, Colin. "A Mayoral Campaign Fueled by the Religious, Conservative Wing of the NYC Democratic Party". Politicker.com. Retrieved April 11, 2013. ^ Hakim, Danny (January 5, 2010). "Thompson to Run for Mayor in 2013". The New York Times. Retrieved October 4, 2010. ^ "Anthony Weiner makes it official, he's running for mayor". Daily News. Retrieved May 22, 2013. ^ Chen, David W. (October 15, 2012). "Mayoral Hopeful Switches to G.O.P." The New York Times. Retrieved October 21, 2012. ^ Susman, Tina (December 22, 2011). "Alec Baldwin drops idea of running for mayor of New York". Los Angeles Times. Retrieved December 22, 2011. ^ Barbaro, Michael (December 3, 2012). "Bloomberg Asked Clinton to Consider Succeeding Him as Mayor". New York Times. Retrieved December 4, 2012. ^ "Bronx Borough President Ruben Diaz Jr. abandons 2013 Public Advocate race; will focus on re-election". Daily News. New York. Retrieved January 24, 2013. ^ Benjamin, Liz (December 13, 2011). "Minus One 2013 Candidate In NYC, Floyd Won't Run (Updated)". Capital Tonight. Retrieved September 17, 2012. ^ Calder, Rich (September 14, 2011). "Fuhgeddaboutit! B'klyn Beep Marty retiring from politics". New York Post. Retrieved December 22, 2011. ^ Fleisher, Lisa (June 26, 2012). "Moskowitz Delays a Run". Wall Street Journal. Retrieved November 2, 2012. ^ Walker, Hunter (November 18, 2012). "Scott Stringer Officially Enters Comptroller Race". Politicker. Retrieved November 18, 2012. ^ The Editors, The Nation. August 8, 2013. "Bill de Blasio for Mayor." ^ Grynbaum, Michael M. (August 6, 2013). "Soros Endorses de Blasio for Mayor". The New York Times. ^ a b c Chen, David W. (May 18, 2013). "City's Largest Union Says It Will Endorse de Blasio". The New York Times. ^ ""PSC Endorses Bill de Blasio for Mayor"". Archived from the original on September 4, 2013. Retrieved September 4, 2013. ^ Paula Katinas, Snubbed: Bay Ridge Democrats pick Thompson over Hynes (May 22, 2013), Brooklyn Daily Eagle. ^ a b Jonathan Lemire, Bill de Blasio picks up endorsement of Communications Workers of America (May 21, 2013), New York Daily News. ^ Mary Frost, "As fight for LICH goes on, nurses flex new political muscles in NYC" August 29, 2013 "Brooklyn Eagle"
^ Michael J. Feeney, DeBlasio wins key uptown endorsement for mayor (May 22, 2013), New York Daily News. ^ a b c d e f g h i j k "Endorsements". billdeblasio.com. Archived from the original on August 6, 2013. Retrieved September 3, 2013. ^ a b c Denis Slattery, De Blasio racks up endorsements in the Bronx, but State Senator Diaz cautions support could be hurtful (April 26, 2013), New York Daily News. ^ Erin Durkin, Bronx State Senator Ruth Hassell-Thompson Endorses Bill de Blasio (April 20, 2013), New York Daily News. ^ Ravitch, Diane (August 27, 2013). "Why I Endorse Bill de Blasio for Mayor of New York City". Diane Ravitch's Blog. ^ a b Michael Howard Sail and Mike Vilensky, [Hollywood Weighs in on Race for Mayor] (May 1, 2013), Wall Street Journal. ^ Huffington Post, July 30, 2013 "Harry Belafonte Endorses Bill de Blasio In New York City Mayoral Race"
^ Joe Coscarelli, "A Bunch of HBO Stars and Russell Simmons Are Voting for Bill de Blasio", (August 27, 2013) "New York Magazine"
^ a b Chen, David W.; Barbaro, Michael; Kaplan, Thomas (September 11, 2013). "Democrats Press Thompson to Forsake a Runoff". The New York Times. Retrieved September 12, 2013. ^ a b c d e f g h i j k l m n o p q r s t u v w x y z aa ab ac ad ae af ag ah ai aj ak al am an ao ap aq ar as at au av aw ax ay az ba bb bc bd Barkan, Ross (September 12, 2013). "Democratic Establishment Rushes to Back Bill de Blasio". Politicker. Retrieved September 12, 2013. ^ Campbell, Colin (September 12, 2013). "Bill Thompson Supporters Start to Jump Ship". Politicker. Retrieved September 12, 2013. ^ a b c d Joe Anuta (May 23, 2013). "Qns. Dem party backs Quinn". Times Ledger. ^ a b Tom Wrobleski, John Liu gets backing of Staten Island's South Shore Democratic Club in race for mayor (May 23, 2013), Staten Island Advance. ^ Jill Colvin and Colin Campbell, Slew of Brooklyn District Leaders Endorse John Liu (May 17, 2013), Politicker. ^ Wall Street Journal, May 29, 2013, "Big NYC public-employee union picks Liu for mayor"
^ "Christine Quinn: The News says she's the best Democratic primary candidate to lead New York City as mayor". New York Daily News. August 26, 2013. Retrieved August 26, 2013. ^ Grossman, Andrew (March 18, 2013). "Maloney Endorses Quinn for Mayor". The Wall Street Journal. ^ a b c "Over 100 Groups and Community Leaders have Endorsed Christine Quinn". quinnfornewyork.com. Retrieved September 3, 2013. ^ Michael M. Grynbaum, Sick-Pay Deal Lets Steinem Back Quinn for Mayor (April 10, 2013), New York Times. ^ Michael M. Grynbaum (February 9, 2013). "An Endorsement Hard to Pass Up, and Harder to Promote". The New York Times. ^ Wrobleski, Tom (June 1, 2013). "With Staten Island Pride Parade as backdrop, Assemblyman Matt Titone backs Christine Quinn for mayor". Staten Island Advance. SILive.com. Retrieved July 25, 2013. ^ Granthon-Gerdine, Miryam (February 5, 2013). "Making News – Erick Salgado". Salgadonyc.com. Archived from the original on July 6, 2013. Retrieved July 5, 2013. ^ "Erick Salgado Kicks Off Mayoral Campaign: 'I Speak with an Accent, But I Don't Think with an Accent'". Matzav.com. April 5, 2013. Retrieved July 5, 2013. ^ a b c d David W. Chen, [Thompson Gets Key Endorsement From Bronx Borough President] (May 7, 2013), New York Times. ^ David W. Chen, Thompson Picks Up Backing of a Fiscal Repairman (May 8, 2013), New York Times. ^ a b Dana Rubinstein, Citing his positivity, the Serranos endorse Thompson for mayor (May 2, 2013), Capital. ^ "Jimmy McMillan: Anthony Weiner for mayor". Politico.Com. Retrieved September 1, 2013. ^ Shushannah Walshe, Clintons Won't Endorse Weiner, or Anyone Else, in NYC Mayoral Race (May 22, 2013), ABC News. ^ Azi Paybarah, Gillibrand is a 'big fan' of Quinn, but won't make a primary endorsement (May 17, 2013), Capital. ^ Thomas Kaplan, Cuomo's Attack on Weiner? It's Now Called a Joke (May 23, 2013), New York Times. ^ Celeste Katz, And For Mayor Of New York, Manhattan's Democratic Party Endorses... No One (May 17, 2013), New York Daily News. ^ Chris Bragg, Brooklyn Dems won't endorse for mayor, advocate (May 17, 2003), Crain's New York Business. ^ Katz, Celeste (June 3, 2013). "Joe Lhota wins Conservative Party ballot line for mayoral election". Daily News. Retrieved July 25, 2013. ^ Hawkins, Andrew J. (February 22, 2013). "Conservative Party eyes mayor's race". Crain's New York. Retrieved April 14, 2013. ^ a b Katz, Celeste (May 7, 2013). "Republican John Catsimatidis Endorsed by Liberal Party in NY Mayor's Race". New York: Nydailynews.com. Retrieved July 25, 2013. ^ "Candidates". Archived from the original on September 7, 2012. Retrieved April 14, 2013. ^ Katz, Celeste (February 23, 2013). "Independence Party Endorses Adolfo Carrion Jr. for New York City Mayor". Daily News. Retrieved February 26, 2013. ^ Sale, Anna (February 26, 2013). "Adolfo Carrion Launches Mayoral Campaign in the Bronx". WNYC. Retrieved September 1, 2013. ^ "Working Families Party Leaders Back Bill de Blasio for Mayor of New York City" Archived October 7, 2013, at the Wayback Machine. Retrieved September 1, 2013. ^ a b Bragg, Chris. "Confidential memo exposes WFP endorsement battle". Crains New York (blogs). Retrieved July 25, 2013. ^ a b c "Race Overview: Mayor". Decide NYC. Archived from the original on September 28, 2013. Retrieved September 27, 2013. ^ Board of Elections in the City of New York. "The Contest List: General Election 2013 - 11/05/2013" (PDF). ^ a b c d e Richard Winger (September 27, 2013). "Fifteen Candidates on New York city November 2013 Ballot for Mayor". Ballot Access News. Retrieved October 1, 2013. ^ a b c "Liberal Party Decides Not to Give Nod to Hidary". Liberal Party of New York. September 24, 2013. Archived from the original on October 2, 2013. Retrieved September 27, 2013. ^ MRANTHONY (April 4, 2013). "Where We Are Now in the Mayor's Race". Liberalparty.org. Archived from the original on July 4, 2013. Retrieved July 25, 2013. ^ Katz, Celeste (March 18, 2013). "NYC 2013: Tom Allon Drops Out, George McDonald Scales Back, Liberal Party Reassesses". New York Daily News. Retrieved April 20, 2013. ^ a b Katz, Celeste (April 10, 2013). "Joe Lhota Will Decline Libertarian Party Nomination; Won't Co-Star With Kristin Davis". Daily News. Retrieved July 5, 2013. ^ a b "NYC Libertarians nominate new candidates for Mayor, Comptroller". Independent Political Report. Retrieved July 5, 2013. ^ "Campaign 2013". Libertarian Party of New York. Archived from the original on May 9, 2013. Retrieved July 5, 2013. ^ "Michael Sanchez". Libertarian Party. Retrieved July 5, 2013. ^ "Campaign 2013". Ny.lp.org. Archived from the original on May 9, 2013. Retrieved July 5, 2013. ^ a b c Katz, Celeste (April 10, 2013). "Joe Lhota And Kristin Davis: NYC's 2013 Libertarian Party Ticket?". Daily News. Retrieved July 25, 2013. ^ The Huffington Post. "Madam Mayor: The Fantastic Quest of "Manhattan Madam" Kristin Davis, Freedom Fighter". Retrieved February 18, 2013. ^ "Update on 2013 NYC Mayoral Race". ThirdPartyPolitics.us. March 22, 2013. Retrieved July 25, 2013. ^ Walker, Hunter (September 14, 2012). "Jimmy McMillan is Running for Mayor (Again)". Politicker. Retrieved September 17, 2012. ^ A Rent Is Too Damn High Party Event. Press release (September 11, 2012). Retrieved September 11, 2012. ^ "Two Socialist Workers Party Mayoral Candidates Go on Fact-Finding Trip to Egypt". Independent Political Report. August 13, 2013. Retrieved September 26, 2013. ^ Tom Wrobleski (July 1, 2013). "Michael Post, a DEP worker from Staten Island, mounts maverick mayoral bid". SILive.com. ^ Pehme, Morgan (October 4, 2012). "Tony Danza Not Running For Mayor After All". City & State. Archived from the original on October 2, 2013. Retrieved September 29, 2013. ^ Long, Colleen; peltz, Jennifer (June 3, 2013). "Ray Kelly, New York City Police Commissioner, Says He's Not Running For Mayor". The Huffington Post. Retrieved June 30, 2013. ^ a b "Statement and Return Report for Certification - General Election - November 5, 2013" (PDF). Board of Elections in the City of New York. Retrieved January 2, 2014.